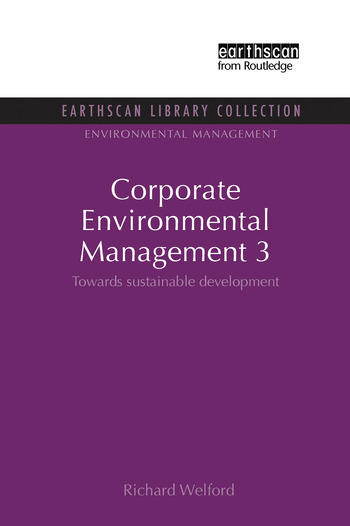 This third book in the Corporate Environmental Management series examines the sorts of strategies that companies can put into place to make their performance more consistent with the concept and practice of sustainable development whilst taking into account the impacts of free trade and globalization. This book: tackles the nature of the international economic order and the efficacy of free trade; outlines strategies for managers, researchers and academics to develop operations consistent with sustainable development; and, finally, offers substantial references to leading articles in the field. Towards Sustainable Development in a Postmodern Society Social and Ethical Issues for Sustainable Development International Business, Globalization and Development Towards Sustainable Production and Consumption: From Products to Service Towards Sustainable Marketing Towards Sustainable Development: a Buddhist Path Deep Change or Slow Death: What Future for Business? Richard Welford is Professor of Corporate Environmental Management at the University of Huddersfield, Professor of Sustainable Management at the Norwegian School of Management and a Director of ERP Environment.